We were not planning on another puppy with Rocky being a puppy himself; however, I have always loved Casey and love what she has produced. And having watched the litter grow from birth to 8 weeks, I could not resist ... it was just hard deciding which one would be "our girl." Mikki is a genuine sweetheart and is always willing to learn new things and please me ... whether in the conformation, obedience, or rally rings. She not only has beauty, but she has the brains to back up her beauty. ~Finished 2013 with being Ranked #4 in the Owner Handler Series with only 2 months of showing. ~Ranked in the Top 20 at #17 for statistics through 09/30/2013 with only 2 months of showing. ~Finished her Bronze level Grand Championship. ~Finished her CDX (Companion Dog Excellent) title. 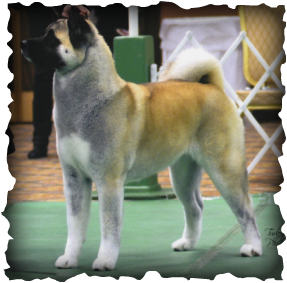 Mikki is owner/handled throughout her championships and performance titles. It's hard to believe, but our Mikki is now a veteran and she will be making us proud as she makes appearances in the veteran ring at shows where it is offered.